It’s been nine whole months since the members of Cheese Club have been together (or, as Dr. Matthews re-dubbed it, The Greater Cheese Society of North America). If you have no idea what I’m talking about, check out this post. 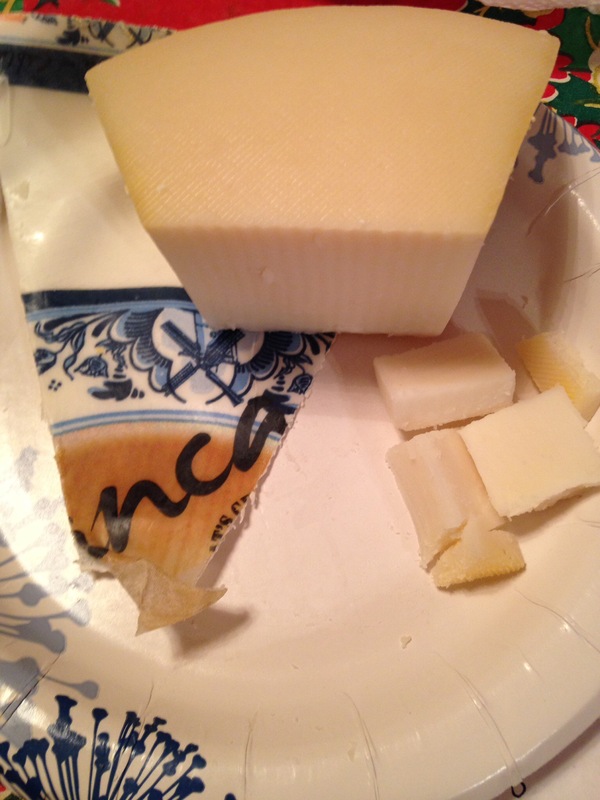 Alas, the holidays brought us back together and we resumed our quest to try new cheeses by going through the alphabet. This time we explored letters E-H, and were not held back by this former pregnant lady’s demands for pasteurization. I am also going to include the grocery store’s description of each cheese, as some of them were particularly entertaining and/or offered additional detail. Resembles a sharp parmesan, or as some stated, an “improved” parmesan. 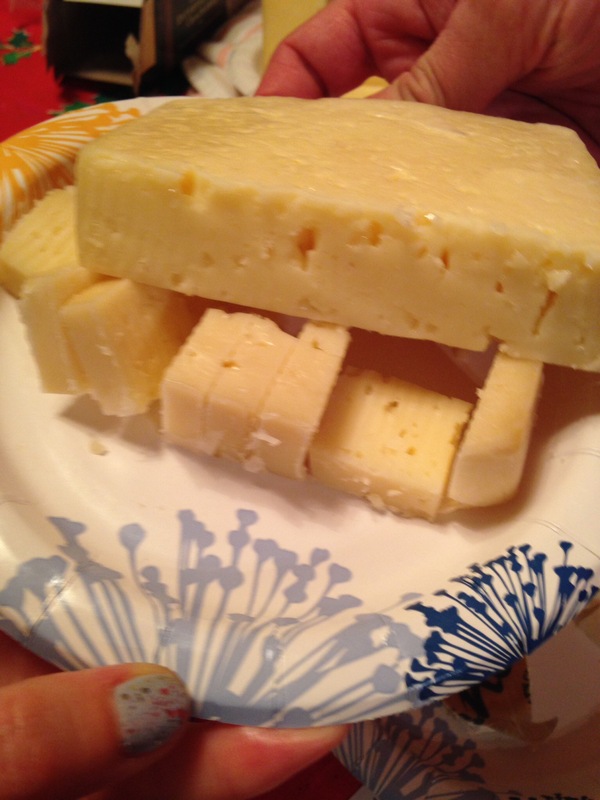 This cheese was described as smooth and mellow and was a favorite amongst many members and ad-hoc members. Dr. Matthews and my bro-in-law, Matthew, noted it was a favorite in particular. The flavor from the espresso grinds along the rind was very pronounced and unique. Need an eye opener? This is the cheese for you. Aged Bellavitano, sweet and caramelly, is covered in finely ground freshly roasted espresso. So good, you’ll want to run to Wisconsin to get more! 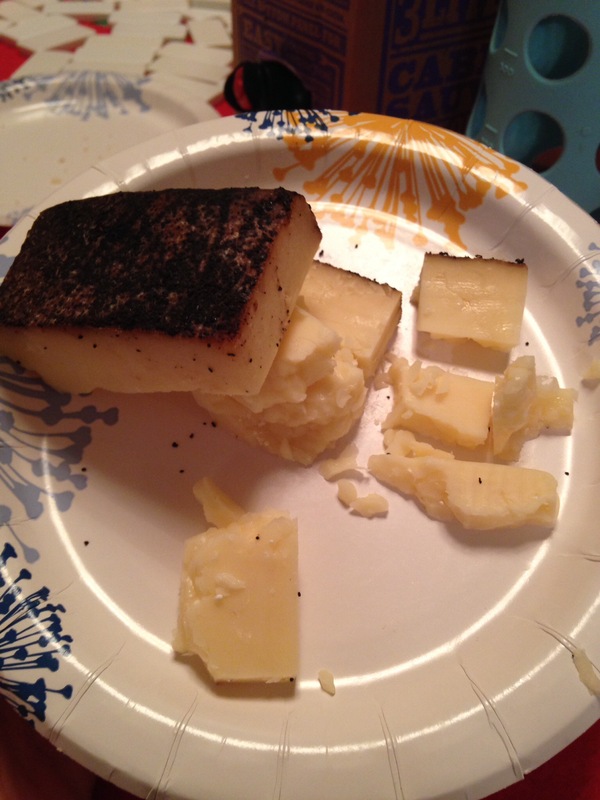 Espresso Bellavitano is a unique Cheddar-Parmesan inspired Italian farmstead cow’s cheese rubbed with fresh ground Italian roast espresso beans. The sweet, slightly smoky, roasted flavours of an espresso coffee complements the creamy and sweet BellaVitano. A Sartori-family original, this gourmet cheese is a celebrated gold medal winner at the 2014 World Cheese Awards. This artisan cheese tastes delicious with sweet pastries, nuts, bagels, chocolate and dried apricots. Salty, buttery, creamy, mild and soft. Would taste good melted. This was my favorite from our second tasting session. 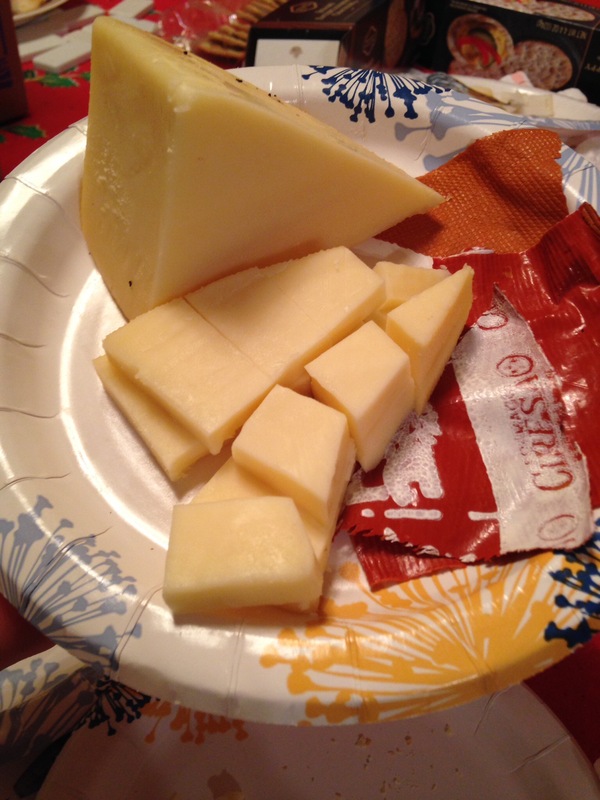 I wasn’t able to find this particular cheese on cheese.com so I just took the description from regular fontina. Fontina is a swedish style cheese made by Emmi Roth USA. Fontina is a hard cheese which has a creamy texture and a subtle tart flavour characterized by a mild yeasty finish. It melts beautifully which makes it ideal for Pizzas, flatbreads, lasagnas, quesadillas. This cheese had a mild scent. It was salty and a little sharp with strong flavor. Definitely less creamy than original goat cheese. We thought that it’d be good on a salad and better on something than by itself. Or perhaps coated in sesame seeds and fried, as regular goat cheese is sometimes served. 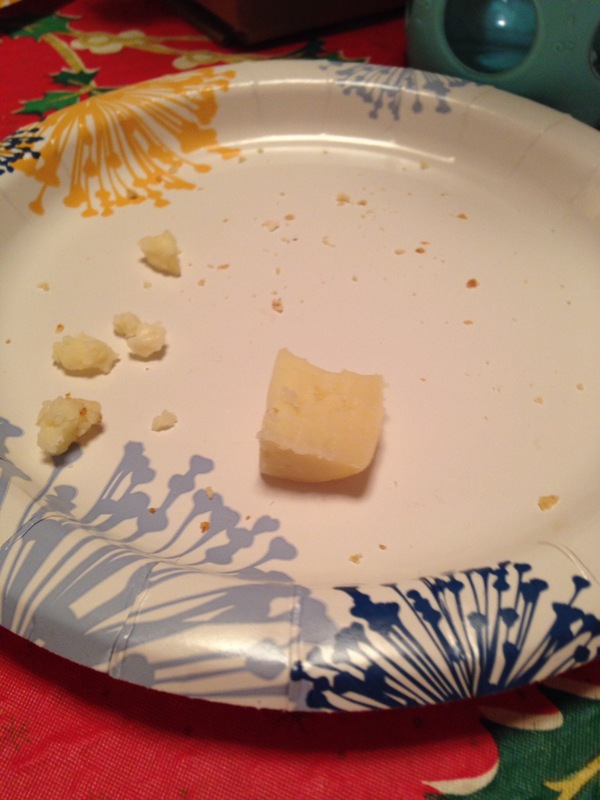 It should be noted that my cousin, Kim, who does not normally enjoy goat cheese, still did not like it in this form. Fool your non-goat-cheese-loving friends (or not) with this mild sweetie that reveals minimal goatiness. Palate-pleasing, semi-firm texture, pretty pale paste, and a mild, vaguely fruity-sweet flavor that’s unlike any Gouda you’ve ever had. Goat Gouda is a semi-hard cheese made from pasteurized goat’s milk and cream, produced by the Central Coast Creamery in Paso Robles, California, US. Firm, dense and smooth textured cheese is slightly grainy with hints of caramel. The rind is hard and natural with ivory colour interior. This nutty and milky flavoured cheese takes about 5 months for maturation. This is one Great Dane. Don’t mistake this Scandinavian gem with a regular Havarti (we should be so lucky), you won’t do it justice. Washed in brine, it’s full and intense, perfect for slicing and melting on dark bread. Inspired by the Danish cheese making techniques, Havarti is a fresh, semi-soft cheese made using pasteurized cultured milk, cream and natural ingredients. Made by Emmi Roth USA in Wisconsin, the cheese is rich and creamy in flavour. The cheese can be mild to sharp in flavour and buttery depending on its aging. Havarti is a table cheese which can be sliced or grilled and can be served with fruit and wine. Havarti is also available in different flavours.